This research paper looks at the different factors that shaped the perceptions and practices of residents and aid providers in Canoa, Ecuador after the earthquake of April 2016. The paper focuses on the earthquake´s social rather than economic impact. The analysis focuses on three main elements that shaped perceptions and practices. The three elements are: conceptions of social vulnerabilities beyond the notion of poverty; the influence that the relationship between people and places has on people´s perceptions of risk and aid provisioning; and the discourse of the resilience approach to aid as a way to empower affected populations after a disaster. 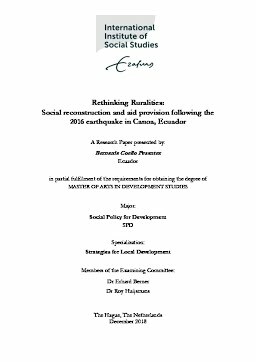 By applying a qualitative methodology to analyse Canoa as a typical example of small rural town in Ecuador affected by the earthquake in 2016, this paper highlights the importance of a contextualised study of social domains hit by earthquakes.